Convert your Port-A-Chopper into a watercraft or utility trailer. Easy-to-install fenders will fit over both 8-inch and 12-inch tires. For motorcycles with wide rear tires, the Port-a-Chopper may be ordered with 8-3/4 inch wide ramp and rear channel. 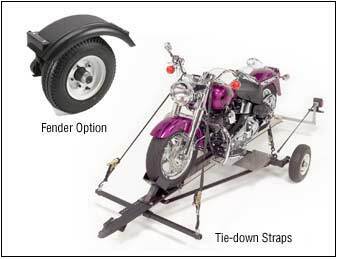 For motorcycles with wide rear tires, the Port-a-Chopper may be ordered with 12-1/2 inch wide ramp and rear channel. As an option, you can upgrade to 12-inch tires. This optional package includes six nylon 1,000 lb. ratchet straps with matching soft straps. As desired, 8-inch and 12-inch tires are available.